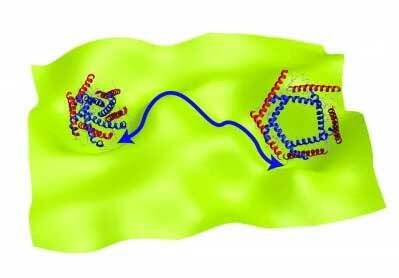 (Nanowerk News) A University of Arkansas chemist and his collaborator at North Carolina State University have developed a new theory for explaining how proteins and other biomolecules function based on movement and change of shape and structure rather than content (The Journal of Physical Chemistry Letters, "Effective Riemannian Diffusion Model for Conformational Dynamics of Biomolecular Systems"). Proteins are considered the workhorse molecules of cells. They are responsible for nearly all tasks in cellular life, including product manufacture, waste cleanup and routine maintenance. For example, some proteins are responsible for transport of materials and information between the cell and its environment, a vital task for the survival and normal function of the cell. Any disorder in protein function could result in disease, and the study of protein function is necessary for understanding the molecular basis of disease. Moradi and Fakharzadeh will address two interrelated questions to further develop their theory: How do proteins function by changing their conformation and by undergoing concerted motions, and how can these conformational changes be simulated at an atomic level? Answering these questions would shed light on the structure-function relationships in proteins, Moradi said, and could improve scientists’ understanding of diseases at a molecular level.